Today, I will be sharing Part 3 of my Summer Kitchen Series!! But first, I want to Thank Karren, over at Oh My Heartsie Girl, for featuring my post, Summer Kitchen, Part 1, from last week's Friday Feature Linky Party!! More vintage pieces........ A tole tray, roosters and an egg cup!!! A vintage sifter and a martini shaker filler with pasta!!!! A neighbor gave me this vintage Chlorox bottle!!! How cool is that!!!!! In the center, hangs an egg wreath that I actually bought a few years ago at Micheal's after Easter one year for 90% off!!!! I wanted to share with you some ornaments that I made and some that I embellished to use for my Patriotic Summer Tree in the Living Room!! So when I found a small tub of things that could be used for Patriotic ornaments, I thought I better do some "dabbling" with them before I take down my Patriotic Summer Tree!! 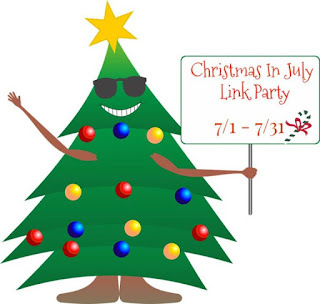 I will be linking up this post to the Christmas in July Party because it shows how you can decorate a "Tree" for other seasons and Holidays!! Joe received these 2 Patriotic coasters through the mail for donating to a Veteran's group so I decided to make them into ornaments!! Transfer Ware and Patriotic Putz Houses! !